Heat a deep-bottomed pan with few drizzles of ghee and fry the chopped cashews and reserve them for future use. Grease the plate with little bit of ghee and make it ready. Mix the corn flour with water and whisk them until there are no lumps. Add the 1 1/2 cups of sugar to the heavy bottomed pan , add the remaining 1 cup of water to it. Mix well. Turn on the heat to medium, slowly mix the sugar solution until the sugar crystals get dissolved completely. Do not disturb anymore and let them come to a rapid boil for few minutes, say 3 to 4 minutes. Slowly pour in the corn flour mixture to the boiling sugar syrup and whisk the mixture continuously so that there are no lumps formed. Keep on stirring the mixture for 5 more minutes and add in the ghee at intervals, start mixing again, keeping the flame at low. Stir the halwa continuously for another 2 to 3 minutes. Now the texture would be like semi thick glassy form. Add the fried cashews at this stage to the halwa and keep stirring more for 5 minutes or until the halwa starts leaving the sides and becomes slightly more thicken than it is in the earlier stage. Finally add the cardamom powder, mix well. 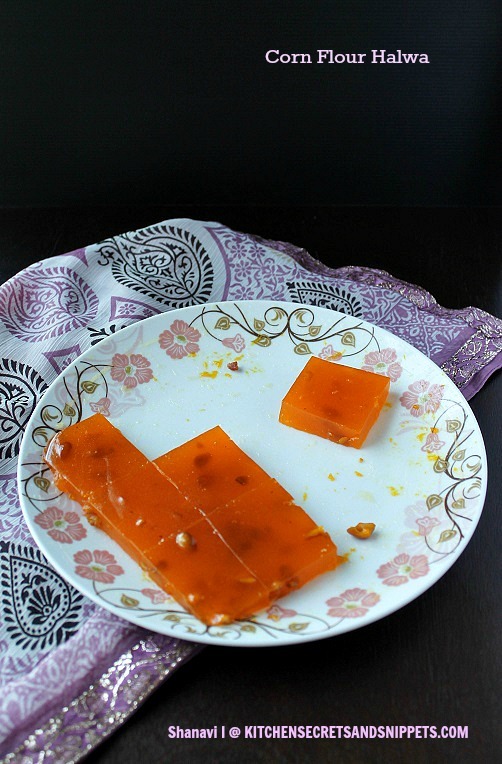 Pour the halwa to the already greased plate and tap the ends to make it even. 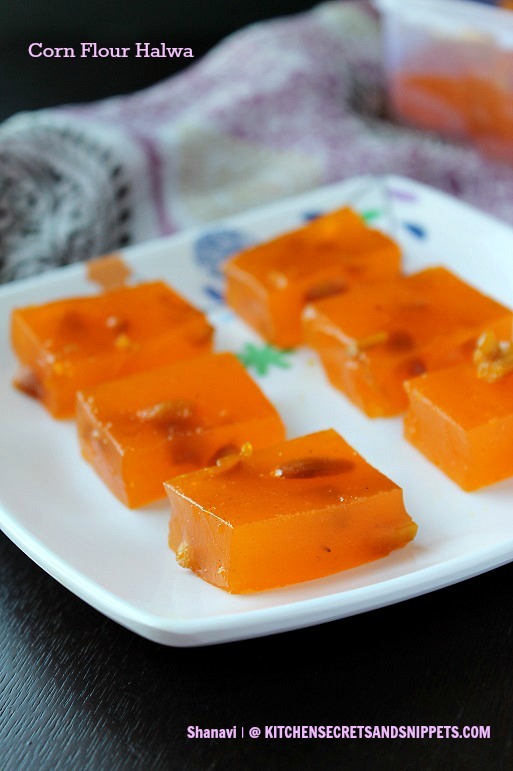 Rest the halwa for the least 1 to 1 1/2 hours and cut into slices and store in the refrigerator for a longer shelf life. The measurement of sugar given here is exactly needed to make a perfectly mildly sweet halwa, if u reduce it further, it will not be tasty. U may add any nuts of ur choice. 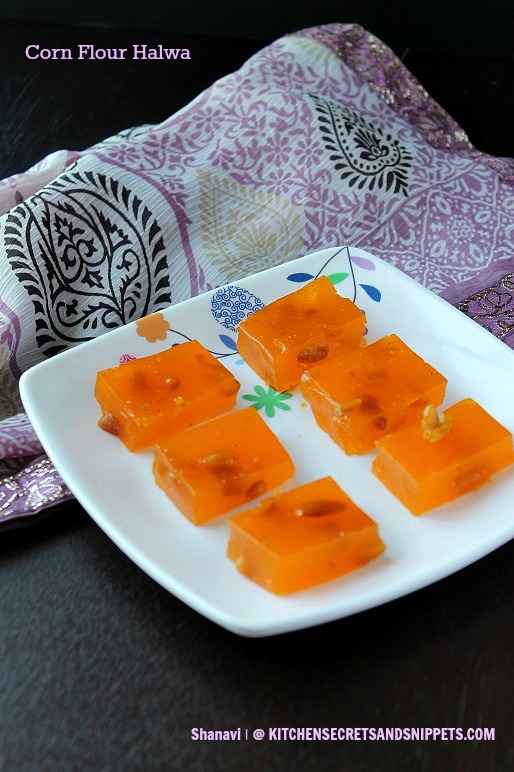 OOOhh eye pleasing n droolworthy halwa dear!! 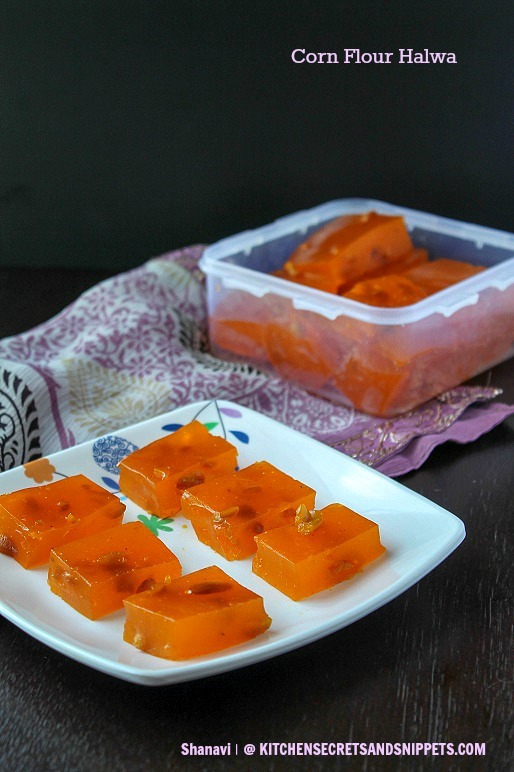 Super glossy and delicious halwa, parcel me some. cornflour halwa looks delicious Shanavi. Halwa looks perfect, loved it. Looks very yummy and colourful. Beautiful clicks yaar and i am very happy to follow your site. 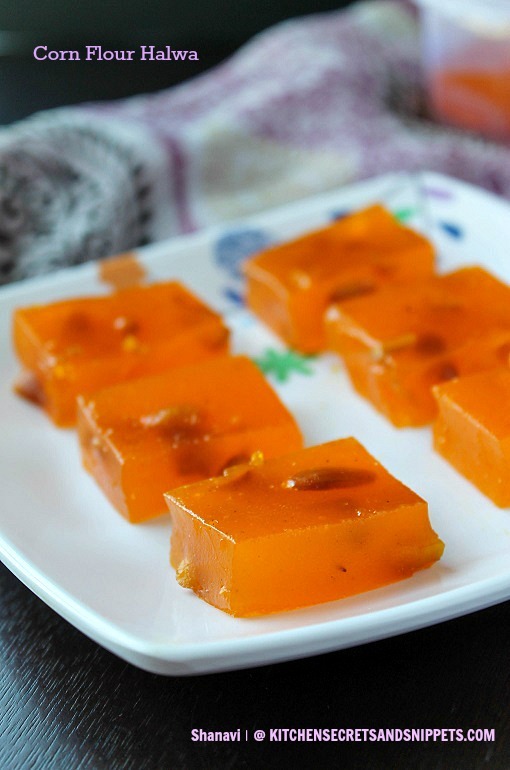 Gorgeous and delicious corn flour halwa. tempting clicks,perfect for a quick bite. This looks so perfect. I have been meaning to make it for some time but have never had the courage. Thanks for sharing your recipe. Funny, my mom & now me too only make cornflour halwa. I have never seen anyone posted this version. You are the first. I've seen in four years. We use milk instead of water. Your consistency came out perfect. Looks wonderful. It is there in my to-do list too. Like the colour you have got. Love it. Wow halwas are gorgeous ! Tempeting click and I prepared N numbers of time and not even clicked once.. I made this last week. and I added a Tsp of lemon to sugar syrup. Finally I have a clear water measurements to make halwa. THanks for your recipe.